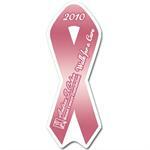 Awareness Ribbon-shaped soft vinyl key tag with your custom imprint. Prices range from .99 to .62 each. THE MORE YOU ORDER, THE LOWER THE PRICE! Prices range from $0.69 to $0.51 each. Glossy lapel stickers are packaged 1000 labels per roll and are perforated between stickers. Prices range from $209.00 to $29.00 per roll of 1000. Our Air Fresheners are economical and provide a long lasting, pleasant fragrance. Thousands of stock shapes to choose from! Prices range from $1.25 to .63 each. 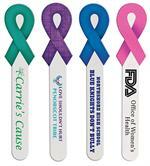 Our Awareness Ribbon shaped bookmarks are printed on 10 point coated paper. Lamination is available for extra durability. Prices range from .59 to .10 each. In a hurry? 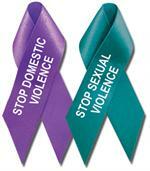 Our stock satin Awareness Ribbons are available in Purple, Teal or Blue and can ship in 3-5 days! Each ribbon has tape on the back. Prices range from $1.09 to .29 each. 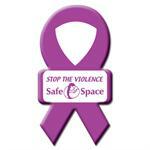 "Stop the Violence" Purple Domestic Violence Awareness Ribbon Key Chain. Prices range from $1.69 to .74 each. Stock Sexual Assault Awareness Ribbon Key Tag "No Means No"
Our stock Sexual Assault Teal Awareness Ribbon Key Tag says "No Means No" in white. Prices range from $1.69 to .74 each. In a hurry? 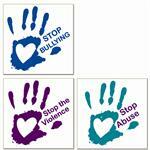 Our stock purple "Stop Domestic Violence" and teal "Stop Sexual Violence" satin Awareness Ribbons can ship in 3-5 days! Each ribbon has tape on the back. Prices range from 1.29 to .39 each. Our stock Swirl Awareness Ribbon Temporary Tattoos are available in Pink, Red, Yellow, Green, Purple, Teal, Lavender or Blue and can ship in 3-5 days! Prices range from .29 to .07 each. 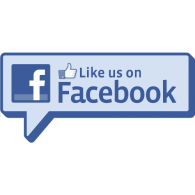 Our Air Fresheners are economical and provide a long lasting, pleasant fragrance. Hundreds of stock shapes to choose from! Prices range from $1.25 to .63 each. 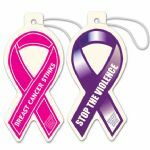 These Metallic Plastic Awareness Ribbon Pins are more stylized with the metallic, textured finish with military clutch backing.Standard production time is 3 weeks. Prices range from $.79 to .23 each. 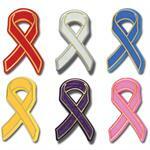 Our economical Plastic Awareness Ribbon Pins have a gold painted trim and a military clutch pin. Prices range from $.79 to .23 each. Size: 15/16" x 9/16". Standard production time is 2-3 weeks.RUSH service is available. 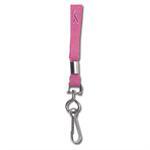 Breast Cancer Pink Awareness Ribbon Lanyard with metal j-hook. Prices range from $1.69 to .69 each. 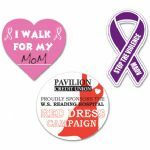 Screen printed Awareness Ribbon Poly Lapel Pins are an affordable solution for anyone who wants a custom Awareness Ribbon without the higher cost & production time of the enameled metal ribbons. Prices range from $1.69 to .75 each. Plastic Awareness Ribbon Paper Clip. Prices range from .59 to .19 each. Full Color custom printed Awareness Ribbon shaped Microfiber Cloth is great for cleaning eye glasses as well as smart phone and tablet screens. Prices range from $1.19 to .87 each. 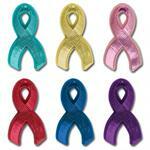 Deluxe enameled metal awareness pins have a more fluid shape and are enameled on both sides. Prices range from $2.49 to $1.59 each. Our Stock Silicone Ribbon Link bracelets are available in purple or teal. This new style of bracelet stands out from the rest and makes a terrific fundraiser or give-away for your awareness events. Prices range from $1.95 to $1.35 each. Stock Ribbon Pen "Love Shouldn't Hurt"
Our Awareness Ribbon Pen has a molded plastic ribbon clip and a comfortable rubber grip. It is white with purple detailing. With the message "Love Shouldn't Hurt" on the barrel. Prices range from $1.49 to .69 each depending on quantity ordered. 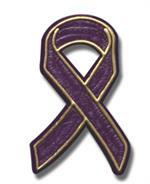 Our economical Plastic Purple Awareness Ribbon Pins have a gold painted trim and a military clutch pin. Prices range from .99 to .39 each. Stock Awareness Ribbon Clip: "Love Shouldn't Hurt"
Our Purple Awareness Ribbon Keep-It™ Clip has a magnet on the back and the message "Love Shouldn't Hurt" printed in white. Prices range from $1.99 to $1.09 each depending on quantity ordered. 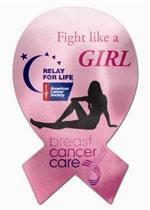 Pink Breast Cancer Awareness Ribbon Pins. CLEARANCE WHILE SUPPLIES LAST! .89 EA! Blue Awareness Ribbon Pins. CLEARANCE WHILE SUPPLIES LAST! .89 EA! Gold Awareness Ribbon Pins. CLEARANCE WHILE SUPPLIES LAST! .89 EA!